Friday saw a milestone in the life of our little family, as we attended our daughter’s Year 11 Thanksgiving Service at the senior school she has attended for the past 5 years. On the day after the final GCSE exam, this occasion brought students, parents and staff together to acknowledge the hard work and dedication that had gone into the last few years. We also looked ahead to the future. As you can imagine, this was a pretty emotional time. Our girl is leaving a community that she has been a part of since was just 2 years, 8 months old. Starting in nursery, she went all the way through primary school and onto the senior school, still with many of the friends she has had since she was a little tot. What I loved about the celebration was its focus not on material success but on leading a values-driven life, full of family, laughter, good times and friendship. It wasn’t about the accumulation of possessions, which might seemingly denote success these days. Instead, it was about giving thanks for what had been given to our young people in abundance. Of course, there was a scripture reading from The Bible (The parable of the hidden treasure and the costly pearl – Matt 13: 4-46). But we also heard three readings that I felt chimed as much with the parents as they did with the students. So, I thought I’d share them with you. If you haven’t taken a moment to read this wonderful poem before, do take a look (it is repeated in full here). 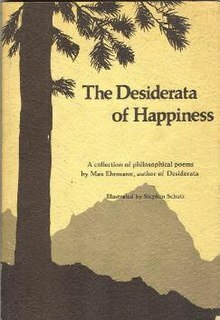 Written by American writer, Max Ehrmann, in 1927 but not published until 1948, Desiderata (Latin: “desired things”) is an incredible code for life. Even when things seem pretty bleak (and we continue to see “bleak” in the media every single day), Desiderata‘s timeless message provides a sage but simple way to look at the world, concluding with: Be Cheerful. Strive to be Happy. Another reading, which particularly struck me, was Anyway, which St Teresa of Calcutta reportedly had written on the wall of her home for children in Calcutta. Tomorrow sees the occasion of the year, as the young people head to Warwick Castle for their Year 11 Prom. It’s a jamboree of prom dresses, tuxedos, hired stretch limousines and borrowed sports cars (not forgetting the spray tans, hair-dos and make-up). It’s my hope that, when all the festivities are over and life returns to normal, the kids remember some of the key messages they heard in Chapel on Friday. We’ll certainly place the order of service in our daughter’s treasures box; she may not look at it immediately but maybe in the future she’ll look back, remember and smile.